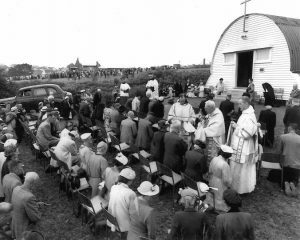 “During the 1940’s, Monsignor Bradley of Remuera bought in his Parish for the Bishop thirteen acres of land, situated between Meadowbank Road and Temple Street. This land was to be the heart of the new parish of Meadowbank. The site decided on for the Church was near Temple Street so an extra piece of land was purchased for an entrance from Temple Street. The area chosen for Mt Carmel School was a small section off Meadowbank Road. Bishop Liston of the Auckland Diocese wished to have many different Religious Orders working in his Diocese. 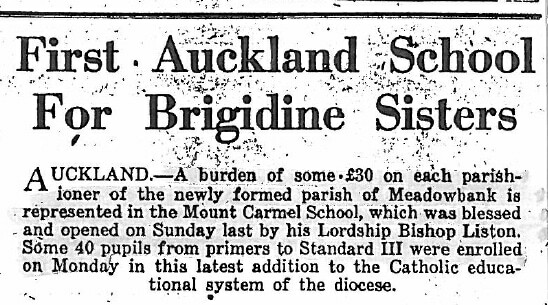 With this in mind the Carmelite Fathers of Melbourne were invited to take over the Parish, and the Brigidine Sisters of the Wellington Archdiocese were invited to staff the primary school. 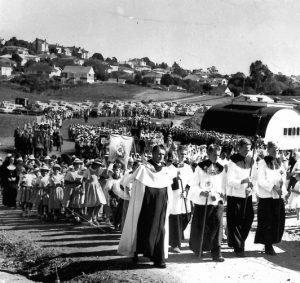 On February 3rd 1952, Mt Carmel School was blessed and officially opened by Bishop Liston, the Bishop of Auckland. Despite the very wet Sunday afternoon, a goodly number of Parishioners and well wishers were there for this solemn blessing. 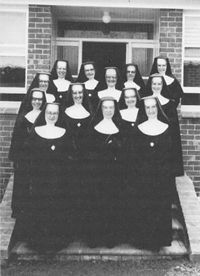 The following day, myself, (Mother Dominica, now Sister Joan McKenna) and Mother Michael welcomed 40 students. Some of these had formerly been at St Michael’s School, Remuera, and others had been at the Meadowbank Public School. These children together with the new entrants made up the roll on the School’s opening day. There were two classrooms for the pupils who were from Infants to Standard 3. At the beginning of the second term, Standard 4 children enrolled and with other new entrants the roll was 60 at the end of the year. 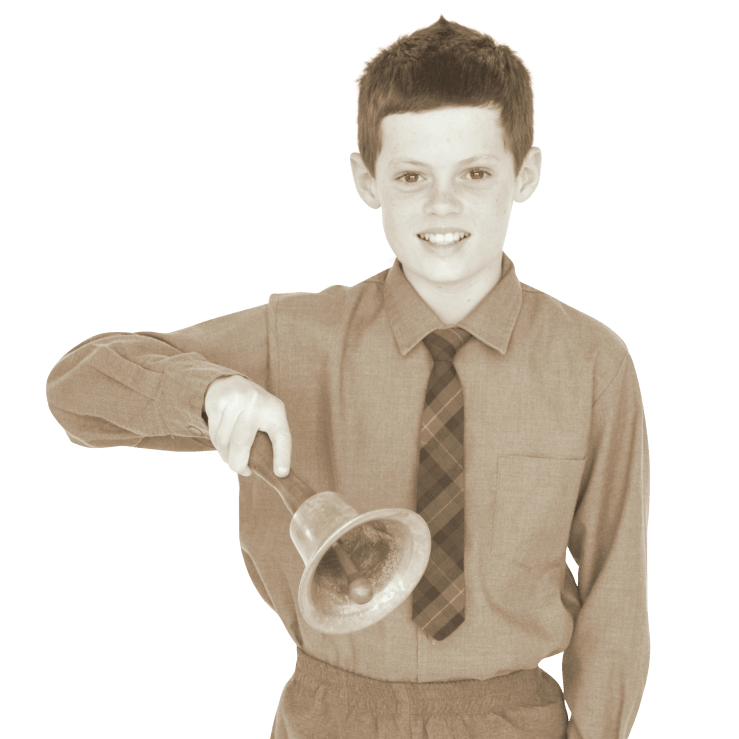 After their Standard 4 year, the boys went off to St Peters or to Sacred Heart College when it opened in Glen Innes. Form 1 and 2 girls completed their education in Mt Carmel before moving on to St Mary’s, Baradene or St Benedicts who at the time has a Secondary School as well as basketball courts in Mountain Road to play Saturday games and any tournaments that were organized. There was rarely a shortage of enthusiasm for either of these games; football or basketball. 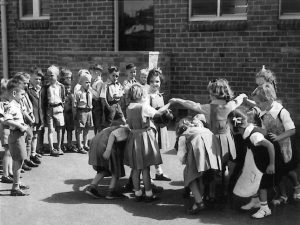 Although a small school, Mt Carmel was always invited to join in any activities that marked special occasions. Two that come to mind are, King George VI dying suddenly and his daughter Elizabeth becoming Queen and Edmund Hillary’s conquering of Everest. As he grew up in the area there was great interest in his achievement. The School at that time was assisted by a Mr O’Connor, a Catholic School Inspector who visited the school each year and always set the end of year examinations for the main subjects. The results were returned to him and there was a reporting back on these. Also, the spiritual welfare of the children was cared for, with Dr Terry in charge of the children’s religious development. There were certain standards or areas of learning to be achieved in each class. On his visits these were checked up on. For all schools it seemed quite a demanding experience for teachers and children. Our school wasn’t long established when Father John Mackie, later to become Bishop Mackie, took over this duty. His approach was very different and I remember Father Mackie listening attentively to children, telling him stories of what they knew and loved about their faith journey. In these Father John delighted. In the early years of the school a Mr Brennan from St Michael’s Parish Remuera came, and generously offered his services as a coach for football for Mt Carmel boys who joined with the boys of St Michael’s school. This was a greatly valued offer and assured boys of being able to play in Saturday sports. The sealed area of the playground was quite inadequate for trying to coach basketball. For a while the girls were taken up on Meadowbank Road to practice. A couple of boys were taken along to watch for cars and were needed to ring a bell if one was approaching and all would run to the footpaths. This was managed quite well till a complaint was made that the sleep of a man who worked shift work was being disturbed. We were very welcome at the long narrow strip of land that stretched from Meadowbank Road to the boundary of houses that had been built on Temple Street. For years, small amounts of fill were being deposited close to the school. They were dealt with as they arrived but still there were gullies to be filled in. Some soil was bulldozed from the piece of land for fill. A big contract came involving a huge amount of fill from Queen Street. To enable this to be done reasonably, the traffic lights were turned off from 11pm to 4am to allow an easy run for the trucks during the night. 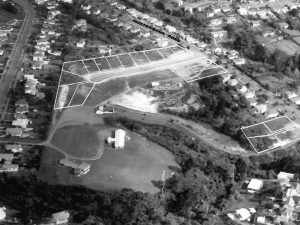 The gullies were floodlit during this operation.In the early years of the school a Mr Brennan from St Michael’s Parish Remuera came, and generously offered his services as a coach for football for Mt Carmel boys who joined with the boys of St Michael’s school. This was a greatly valued offer and assured boys of being able to play in Saturday sports. The sealed area of the playground was quite inadequate for trying to coach basketball. For a while the girls were taken up on Meadowbank Road to practice. A couple of boys were taken along to watch for cars and were needed to ring a bell if one was approaching and all would run to the footpaths. This was managed quite well till a complaint was made that the sleep of a man who worked shift work was being disturbed. We were very welcome at the long narrow strip of land that stretched from Meadowbank Road to the boundary of houses that had been built on Temple Street. The Brigidines are a small group of prophetic women who are called to live courageously the mission of the Gospel in the spirit of St Brigid and Daniel Delany, their Founder. The present day Brigidines hope that students of schools founded by the Brigidine Sisters will rejoice in learning of their history. Brigid’s sacred fire spreads out across the world inspiring us with its warmth and light, challenging us to become more than we have ever been before. Brigid has given us her flame to light the way before us; to strengthen and guide us on our journeys and to be a beacon of hope for the future.